Well, that is actually a huge understatement. I am obsessed by anything with wheels. But this is hardly much of a revelation. Lately, I been spending a little time wondering how much of car ownership is ‘wants’ and how much is ‘needs’. Not just for me, but for all of us. And more importantly, how much do the wants of car ownership cost compared to the needs? Could we all get by with buying much cheaper cars and save ourselves a bucket of cash? My ‘wants’ cause me to currently run 4 cars (Audi S6, 1964 Ford Mustang, Westfield FW400, Peugeot 405 estate). However, when I break it down and look solely at my ‘needs’, pretty much any car will suit my lifestyle. I don’t have kids so I don’t need anything as big as my Audi. I don’t cover huge distances, so it doesn’t have to be overly comfortable. And I don’t ‘need’ to show off in the Mustang or the Westfield (although I REALLY love to!). For one month, I am going to see whether I can get by with just my ‘needs’ – and more importantly to see what my ‘needs’ actually cost compared to the sky-high expense of my ‘wants’. 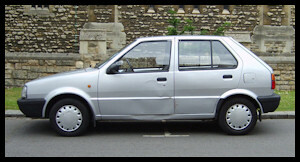 Yes, starting tomorrow morning, Ashley Winston will spend 31 DAYS driving a Nissan Micra. I have already bought a 1992 Nissan Micra with dents all over it and no MOT for £110. I managed to put a new MOT on it for £40. And 6 months road tax cost £115. Add that all together and it is still less than an annual service on my Mustang. I have given my Audi and Peugeot away for a month and will not drive the Mustang or Westfield at all. The one concession is that I will be allowed to drive clients’ cars as and when needed in the course of business (otherwise at the end of the month I may not have a business left!). I will be regularly updating my progress on Twitter –www.twitter.com/thecarguru.